The BEST Fudgy Brownies – These brownies are incredibly soft and fudgy, rich in chocolate flavour, and have a shiny, crinkly top. These really are the best brownies! 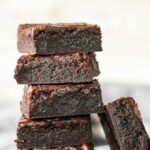 I originally brought you this brownie recipe back in March 2016, but from then and now I have been trying to improve it. I’m very happy to say that today I bring you the BEST fudgy brownies you’ll ever try! Of course everybody has their own version of what a “best” brownie recipe is. Some like rich and fudgy brownies, while others might like their brownies more cakey. But if you’re the ones that like them fudgy and oh so rich, you need to try this recipe. Like, right now. As well as being incredibly delicious, these fudgy brownies are also very quick and easy to make! You only need one bowl and a spatula for these easy homemade brownies, and they take just 30 minutes in the oven. Here are some notes on the ingredients used in this recipe. Granulated sugar: You’ll need 1 and 1/2 cups (300g) which is the perfect amount of sugar – do not try to use less as this may affect results. Cocoa powder: I used Dr. Oetker Fine Dark Cocoa Powder. Large eggs: Cold, straight from the fridge. Plain/all-purpose flour: You only need 1/2 cup (60g) of flour. Using a small amount of flour is what makes for extra fudgy brownies! Chocolate chips: These will start to melt against the warm batter once you start mixing them in, but only fold them in a bit so they don’t all melt. Add the butter, sugar, cocoa powder, and salt to a large microwave-safe bowl. Heat for 1 minute, then stir well. Heat for another minute and stir again. The mixture should be very warm to the touch. Add the eggs and vanilla, and mix in until fully combined. Add the flour and fold in until combined. Add the chocolate chips and gently fold in. Be sure not to let them all melt into the batter. Pour the batter into an 8×8-inch square baking pan lined with parchment paper or foil, and bake for 30 – 35 minutes, or until the centre of the brownies is no longer jiggly and a toothpick inserted comes out almost clean with a few moist crumbs. Leave to cool completely in the pan before cutting into squares. TIP: To speed up the cooling process, I like to put my pan of brownies in the freezer for a couple of hours. This also results in neat, clean slices! To store these fudgy brownies, simply keep them in an airtight container at room temperature or in the fridge for up to 1 week. You can also freeze these for up to 3 months. Thaw overnight in the fridge before serving. 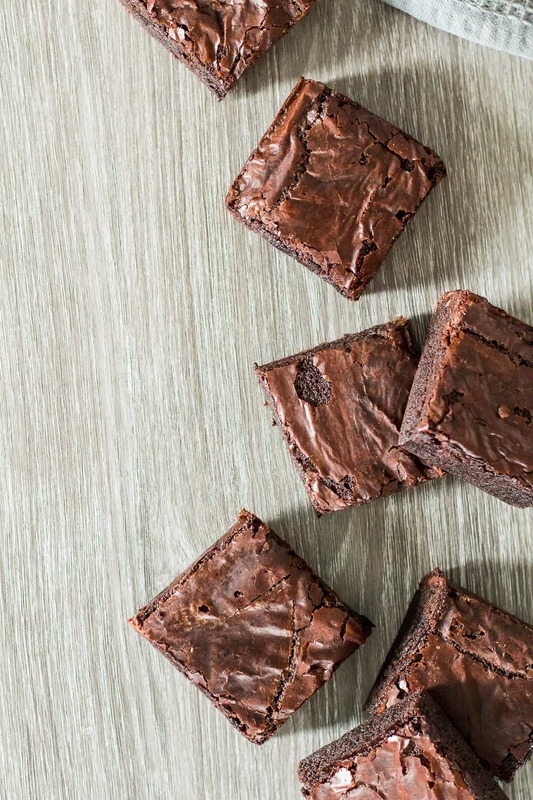 Try these brownie recipes next! These brownies are incredibly soft and fudgy, rich in chocolate flavour, and have a shiny, crinkly top. These really are the best brownies! Preheat the oven to 180C/350F/Gas 4. Line an 8x8-inch square baking pan with foil or parchment paper, and set aside. Place the butter, sugar, cocoa powder, and salt into a microwave-safe bowl, and heat for 1 minute. Stir well, then microwave for another minute. The mixture should very warm to the touch. Add the eggs and vanilla, and mix well until combined. Fold in the flour until fully combined, then gently fold in the chocolate chips. Be sure not to let them ALL melt into the warm batter. Pour the batter into the prepared pan, and bake for 30 - 35 minutes, or until the centre in no longer jiggly and a toothpick inserted comes out almost clean with a few moist crumbs. Allow to cool completely in the pan on a wire rack before cutting into squares. 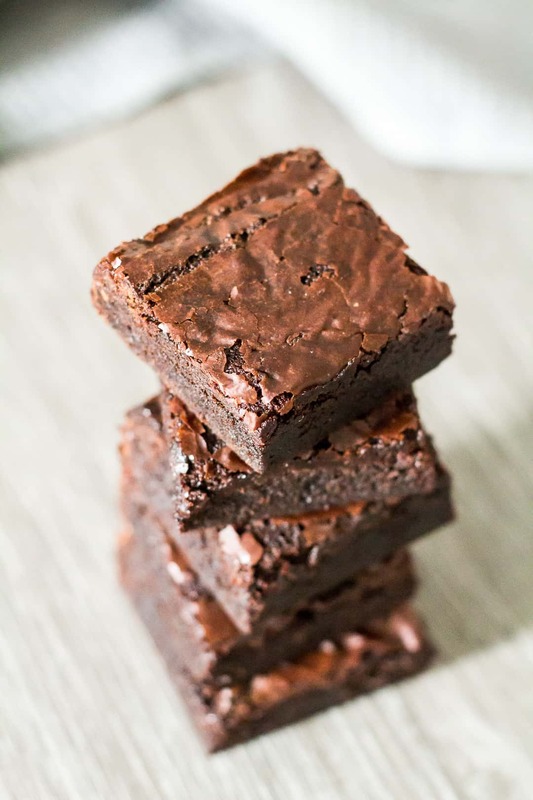 Brownies stay fresh, stored in an airtight container, at room temperature or in the fridge for up to 1 week. They also freeze well for up to 3 months. Thaw overnight in the fridge before serving. Happy birthday Marsha! Having these brownies is a great way to celebrate! Cheers girlie! Happy Birthday! I love brownies, especially chewy ones like these. These look soooo good. Nice B-day treat. These brownies look so chocolaty and so moist. i love a chewy brownie! This looks so amazing! Never have tried brownies with cornflour in them before – definitely curious to try the addition out to mine next time! Last week I was planning to make some brownies for a party. I came here to see if you had any classic brownie recipes but couldn’t find any. Now I’m totally just doing the happy dance seeing this here!!! Can’t wait to try em! Happy Birthday Marsha! This sure looks like a great recipe to have when the Brownie cravings kick in. Thanks for sharing!!! You can just see how deliciously fudgy they are, my perfect brownie! Thick, rich and chewy?! I can totally see why these are your favorite brownies, Marsha! They look crazy delish! Cheers, girlfriend! Belated Happy Birthday Marsha! It’s always a good time for brownies! What an awesome way to celebrate Birthday, Marsha. It can’t get any better. These chewy brownies are amazing. Belated Birthday dear. 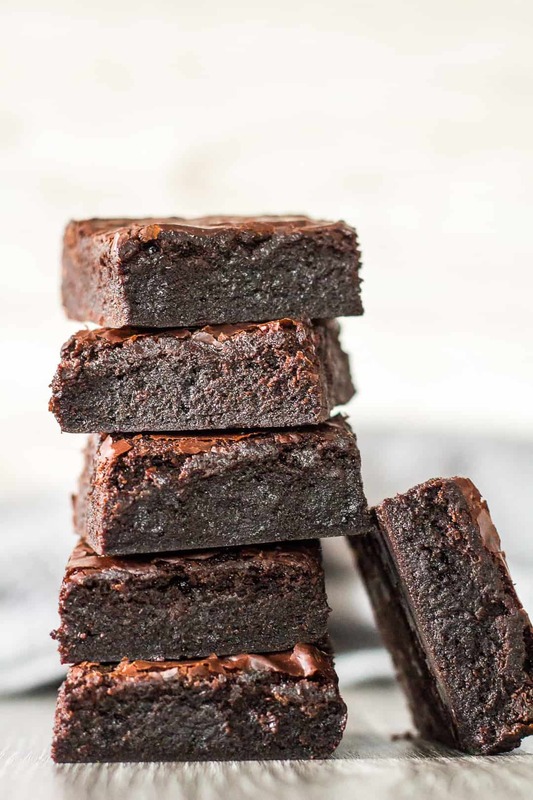 I love chewy brownies and this one is just amazing! When you say “cornflour”, is this the same as cornmeal? I’m coming back to this recipe. 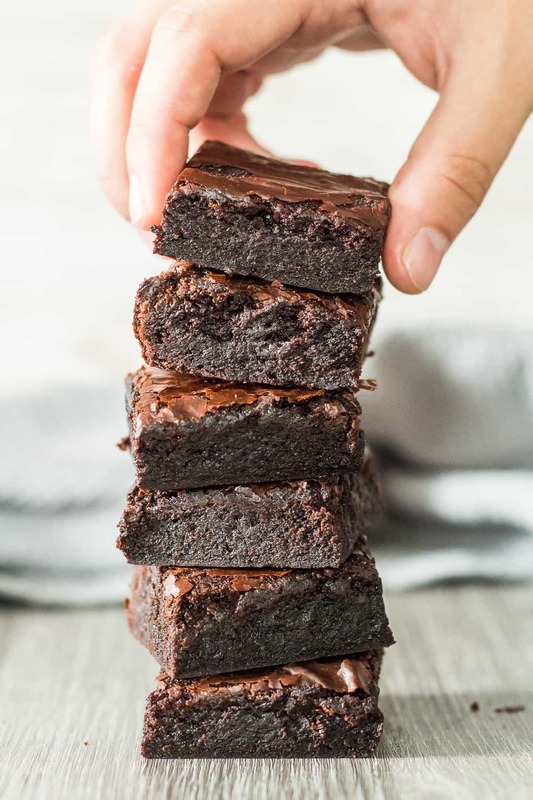 Out of all your brownie recipes, would you say this is the best one in terms of being full of chocolatey flavor? I had a brownie at work and I can’t get my mind off of it. It was delicious. LOL. Hi Linda! These brownies are very chocolatey and so fudgy! 🙂 Hope you’re doing well, too! What is the temperature of the oven and is the heat from both top and below? And the heat should be from above or below or both above and below. Sorry I am a total novice.